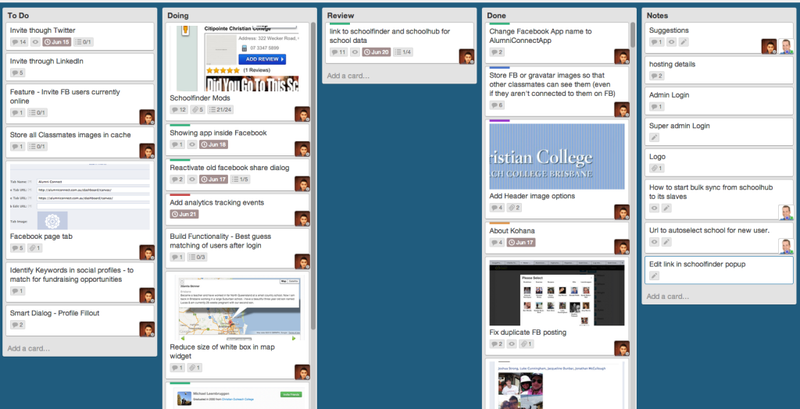 I use trello.com in my business, and I find it a great tool for organising information and assigning tasks to team members. The only thing we find is that when managing multiple boards (projects) at once, there isn’t a way of seeing the most important tasks across all projects on one screen. Fortunately… my business is software development, and one of our guys whipped together a cool little script that will reorganize anyone’s personal cards page by “Labels”, meaning that we can now see the highest priority tasks across multiple projects. Would you like to use this cool little script? *Nice little bonus – This script will also remove the “Done” tasks so you are only seeing the tasks that are yet to be completed. My process is to create new cards/tasks in the ‘To Do’ column and assign it to a team member. That team member will then drag the task to the ‘Doing’ column when they start working on it. They will move the card to the ‘Review’ column when they have completed it. I’ll then review the tasks, add notes and either put it back on the ‘Doing’ column or move it to the ‘Done’ column. We store FTP logins, and any other important info in the ‘Notes’ column for easy access. To use the script above, just add a label to your tasks (You don’t need to name them in trello. The top label corresponds to top priority) – It’s a hassle naming labels across multiple boards (they don’t save from one to the next) so don’t worry about naming them unless you really want to. 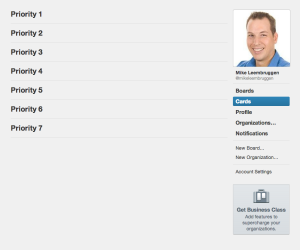 Then navigate to your ‘Cards’ page and click the ‘Sort Trello Cards by Priority’ bookmark link. If you like this handy script, please leave your comment below and let me know? Are you leaving money on the table because your site takes too long to load? The stats say that people will wait up to 2 seconds for your page to load before they click the ‘back’ button and leave forever. This obviously has a direct relationship to your conversion rates. It would make most marketers cringe to think they might be losing sales just because people are exiting their pages before they finish loading. In this post I’m going to show you how I decreased the page load time on my landing page by 36%. This was a result of copying code from another site of mine in the aim of getting the page up quick. I was more concerned about speed of implementation rather than technical perfection at that point but this could be happening on your site too without you realising it. What this meant was that my static page was trying to access a file that didn’t exist and therefore triggering my whole WordPress installation to load it’s standard 404 error page. 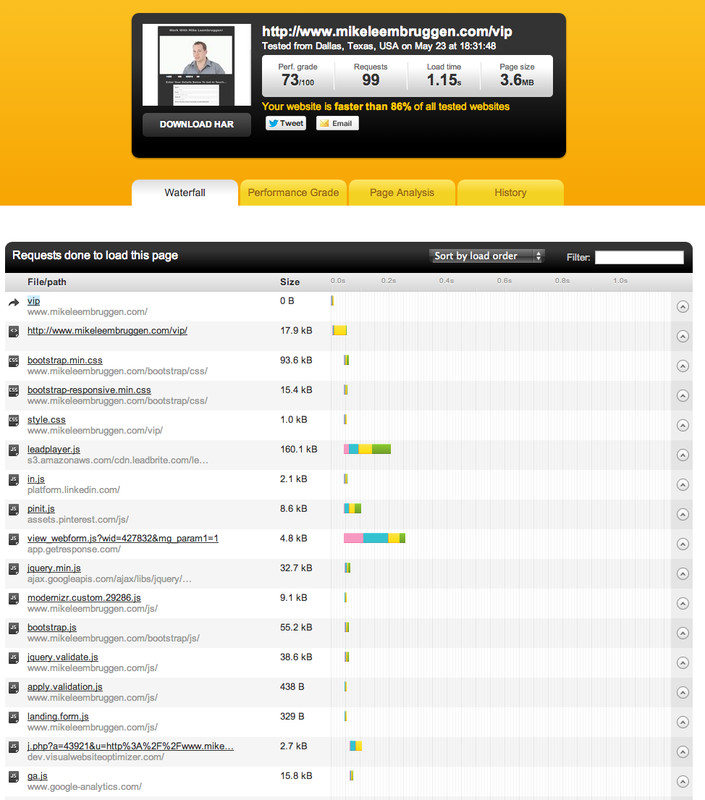 Users wouldn’t see this of course, and either did I but nevertheless it added unnecessary page load time. The whole point of this static page was to be lightweight and not include all the random stuff WordPress loads that I didn’t need. Fixing that issue saw my page load time go from 1.56 seconds down to 1.33 seconds. Next thing to look at was the external requests my page was making. I’m using Leadplayer on this page, with a Getresponse form and I have a few social icons that are making requests to their respective sites as well. The main element slowing down the page was actually the Facebook button. Google +, Pinterest, & Twitter were loading much faster so I decided to remove the Facebook connect option as this page is primarily loading in a Facebook tab anyway. 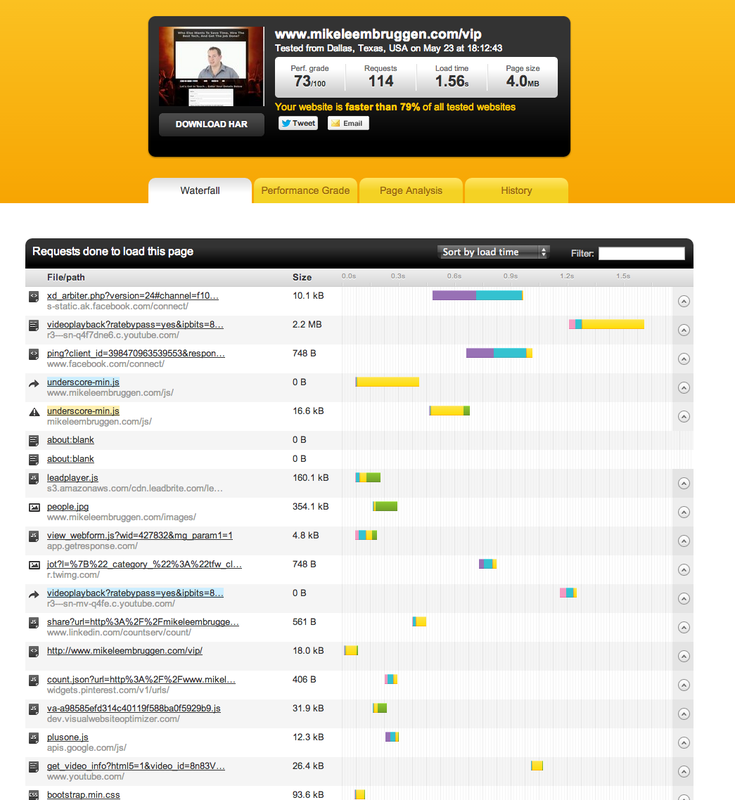 The last element or the last major contributing factor to the page speed was the background image. It’s quite big as it’s not designed to repeat horizontally or vertically so it scales with the page and therefore needs to be of decent resolution to look good on larger screens. Once again as this page is loading in a Facebook tab, the background image doesn’t add a whole lot of design appeal. Most of it isn’t seen anyway as the content is scaled to the maximum width of the tab so I decided to remove this element for now. 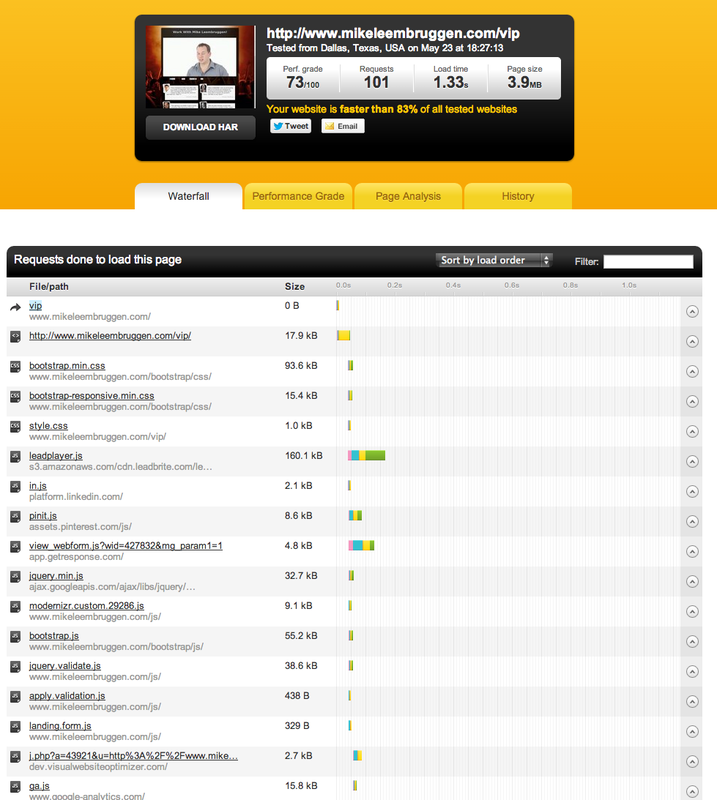 So from a couple quick observations and adjustments, my page now loads 36% faster according to pingdom.com. If you would like me to help you out with your site speed and page load times, please feel free to hit me up. Here’s some interesting results from an experiment I ran through Google Analytics Content Experiments to see which button text would convert the best on one of my websites. This was a page after the homepage, so visitors would click a button on the homepage and then land on this simple name capture squeeze page. As you can see the winner is “Start Now” with a 21% increase in conversion rate over the original text which was “Create account”. Not bad… Who else would like a 21% increase in opt-in conversion? I guess the first vital piece of information to disclose is that I don’t work for either Infusionsoft or OAP, however I do use and manage both products for various clients. There are pro’s and con’s to each platform as you would expect, but hopefully I can give you a bit of insight here as to which direction you should take. It seems interest in Infusionsoft and Office Auto Pilot has increased lately as a greater number of businesses are looking to automate and improve their online marketing and customer management systems. Business owners are getting serious about delivering a fantastic user experience to their customers, and also want to better track customer response to emails, landing pages, sales pages, and upsells. If you are running an online business that does over 10k per month, then you are probably looking for a software that makes your life easier and lets you better gauge customer flow and intent… so you can ultimately make more money. I’m noticing a lot of businesses that were running either Nanacast, or FusionHQ, or even just Paypal payments are looking for that next level of software to automate and improve their marketing. Don’t get me wrong… Nanacast, FusionHQ etc. are excellent options for some people and are much lower priced, but if you are looking for the ultimate in automation, there’s a reason Infusionsoft and OAP are three times the price. Below, we shall look at the features offered by each product and I’ll give you the general consensus as to which product is for who. If you are a single entrepreneur or own a small business. If the total employee strength of your company is less than three. If you are sure that the size and strength of your company is not going to expand, in which case you would have to switch. For bigger companies with a comparatively more complex structure and functioning. If you have sales staff and large teams working for you. If you see the possibility of expansion in terms of the company’s size, function and strength. Traditional company (brick and mortar business) etc. If your business needs emailing in high volumes. If online marketing as well as traditional marketing, in general, are new to you. If you need a more personal touch without having to spend extra money. If you intend to run a multi product store where your customers would buy multiple products and need the ‘add to cart’ button. If your business is B2B, since it is neither aware of business nor has it been factored into its CRM. If you feel there is a need to have capabilities to design visuals. If your business needs more dependency on campaign builder or a visual flow chart. If your business needs community support and support from big events. If you are in need of personal help and not in a position to afford it. If you have the tendency to get overwhelmed and confused by technology, because this is a tad bit complicated. They offer starting packages at around $300 per month. The team package that allows management of a team of 5 members is priced at $597 monthly. It will help you with marketing, up-selling, promoting and monitoring your marketing efforts across the Internet. This also gives you the power to rule and segment your database so as to perform targeted marketing. They offer a wide range of packages. Some start as low as $199 per month, while some start at $999 per month, with a set up fee of around $2000 or above. Infusionsoft also provides CRM, which makes it more effective for bigger companies. It automates email functions, processes payments, built-in affiliate program and other things that you would require to set up an offline or an online business by strengthening sales channels. Monday to Thursday from 7am to 9pm PST. Friday from 7am to 3pm PST. Saturday from 9am to 1pm PST. Sunday from 5pm to 9pm PST. Monday to Friday from 7am to 5pm, Arizona (AZ). Chat support is also available from Monday to Friday for 24 hours a day. On Saturdays and Sundays only chat support is available. Personally, I prefer Infusionsoft from my dealings so far. Their system seems more logical to me, even from just the menu’s and user interface. Sometimes I have to hunt around OAP for a while to find the buried link or option I’m looking for. Having ‘Live Chat Support’ 24 hours a day is a huge plus for Infusionsoft. When you’re working on big campaigns with lots of moving parts, I just want quick answers. Usually my questions are quite technical so sometimes I have to submit a support ticket, but that’s ok. My timezone in Australia is ~15 hours different to the U.S as well, so it’s nice to have Live Chat and get answers any time of the day. Having said that, I work with some big marketers locally and internationally who love Office Auto Pilot, so it does depend a lot on your industry and the features you are looking for. Hopefully this article has given you some insight into which option may be best for you. Please feel free to add your comments below, and if you would like some help setting up OAP or Infusion, please email me at mike@mikeleembruggen.com.